To demonstrate the feasibility of using the S3F in an artificial heart a preliminary test was conducted by ISSI and PSU. An S3F film was cast onto the wall of an Acrylic Penn State 50cc heart model. This film had a thickness of approximately 1-mm and a shear modulus of about 300 Pa. The optically transparent heart model allowed the film to be easily imaged by the data acquisition system. Data was acquired at several phases of the pumping cycle by phase locking the pulsed LED and camera to the pump. 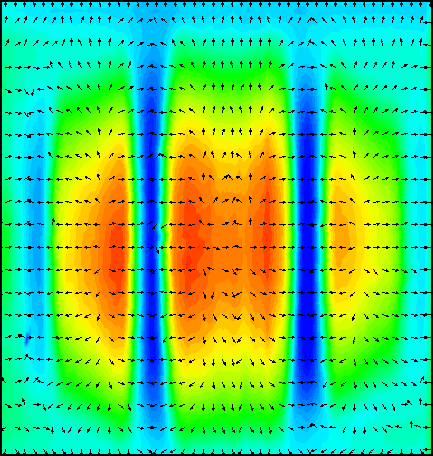 The average result for the shear stress field at 55 ms (early diastole) is shown below. This result shows a large region of uniform shear on the heart wall that indicates the flow is moving away from the bottom wall of the heart, then separating along a line. A single frame of data at 300 ms (late diastole) also demonstrates the complex nature of the flow along the back wall of this model. The shear data from the S3F indicates regions of flow reversal and re-circulation indicative of possible flow separation. S3F can be tuned for a wide range of shear modulus for anywhere from airflow to high-shear contact force. An example of the range of S3F is shown below on an aircraft tire. The acquisition system including the camera, computers and illumination sources are installed in a flat plate where the tire can roll over top of the sensor while the cameras record the deformation from below through a transparent plate coated with S3F. The contact patch showing normal forces can be seen on the left below. Normal force and shear can be calculated from the S3F sensor over a wide range. Rolling forces of 70,000 pounds have been demonstrated with tires. Human gait analysis and shoe research is another S3F application area. The FootSTEPS system is used to conduct gait analysis of the human foot. One area of interest in gait analysis is related to ulcer formation in diabetic feet. Peak plantar pressure has been used as a predictor of ulcer formation in the past but studies have yielded only moderate correlations between diabetic foot ulcers and peak plantar pressure. 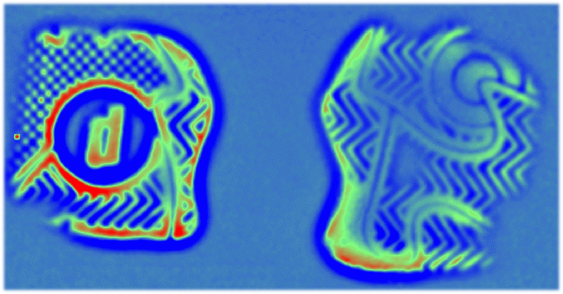 Plantar shear is being investigated as a source of ulcer formation and only FootSTEPS provides the capability and resolution necessary to conduct both plantar shear and peak plantar pressure studies simultaneously. To demonstrate the range of applications for S3F, a small spider was placed on a sensitive S3F layer and allowed to walk across the surface with its normal gait. 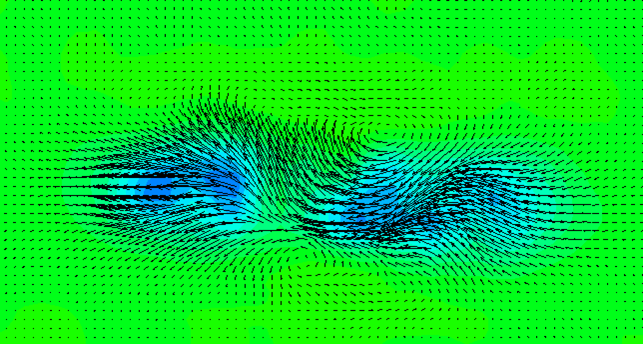 The image below shows the shear field made by the spider's footprint as it walks across the S3F surface.